Sister Ethel (Howard) Dignan, BVM, 94, died June 14, 2018, at Marian Hall, Dubuque, Iowa. Visitation, Sharing of Memories and Mass of Christian Burial were held on Wednesday, June 20, 2018, at the Marian Hall Chapel. Burial was in the Mt. Carmel Cemetery. Sister Ethel was born in Chicago on May 19, 1924, to Francis and Mary Jane Sullivan Dignan. She entered the BVM congregation Feb. 14, 1950, from St. Francis Xavier Parish in New York City. She professed first vows on Aug. 15, 1952, and final vows on Aug. 15, 1957. 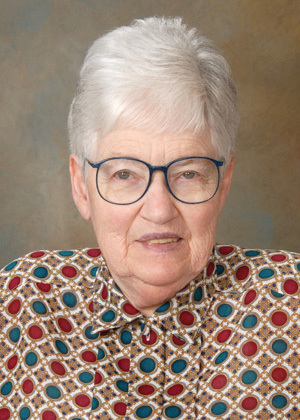 Sister Ethel was a psychology professor and department chair at Clarke University, Dubuque, Iowa. She was a staff psychologist at the Dubuque Community Health Center, Dubuque; Mundelein College, Chicago; and Agnew State Hospital, San José, Calif. She was a clinical psychologist and director at West Valley Mental Health Center, Los Gatos, Calif. She volunteered in Hispanic ministry in Los Angeles and San José, Calif.
She was preceded in death by her parents; sisters Dee McMinn and Patricia Dignan; and brothers Thomas and Francis, both in childhood. She is survived by nieces, grandnieces, grandnephews, and the Sisters of Charity, BVM, with whom she shared life for 68 years.